← Talking to cats, high voice or natural voice? Sometimes I miss the by-gone era of the outdoor cat. Until I look at the list above. To my readers they are just names and causes of death. I remember each cat as though it were yesterday. I hope I haven't left any off the list. Many of my cats had wonderful lives and lived into old age. The average age for the cats whose lives were cut short was 3 years, which is midway the average life span of an outdoor cat. Some references state that 1 1/2 years is average while others state 4-5 years . 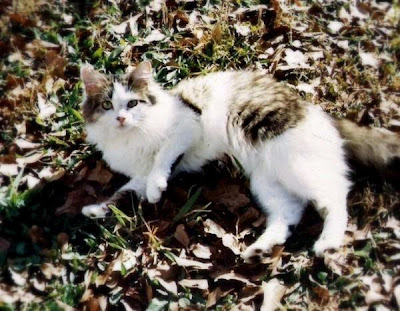 My cat Peeper (yes, you will get a story on her) was the oldest at time of death. She was nine years old. Tigers kitten Baby was the youngest. Mama accidentally ran over him in her driveway. He was less than 3 months old. *Not my cats but I fed them. I grew up in the 1970's and we had no cats past 1968 when I was 7 years old. I asked mama why I couldn't have a cat and she told me she simply couldn't endure losing any more to the road. She refused to have a cat living in the house. If you watch any television show that took place in the 1950-1970's there were few if any with cats living indoors. Cats lived outside and kept down the rat problem and that's just the way it was. 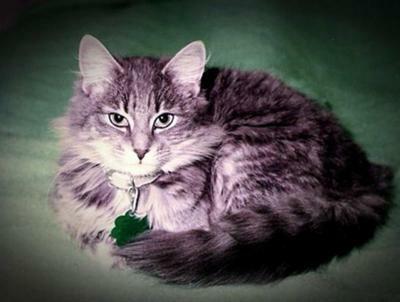 Smokey was my first cat after I married and she was an indoor/outdoor cat. In the early 1980's most cat owners kept their cats in at night and left them outside during the day. It was rare in my part of the country to hear of a cat staying indoors 24/7. The indoor/outdoor cat and owner both had the best of both worlds. The owner didn't have the cat underfoot all day and the cat had the chance to hunt, take naps in the sun and even the occasional fight seemed a form of entertainment for the tomcat. The females usually showed up pregnant or became pregnant at around 1 year of age. That too was accepted and it wasn't difficult finding homes for the kittens. Families spent a lot of time in the yard or sitting on the porch or in a backyard swing. Watching the cats play was a form of free entertainment. All we had in those days was Atari and kids still played outside. I believe the cat population became a problem with urban development and continues to this day. What used to be country isn't country anymore. I have an aerial photo of my childhood home and there were only 4 houses on the road. Now the entire area is commercial property. I'm glad I don't live there anymore. I had to use creative driving skills just to get into the driveway without being hit. The animals didn't have a chance. Their hunting grounds were being replaced with concrete parking areas and small businesses. The reason for them being outside in the first place was eliminated. I have a totally different view now of raising my personal pets. I refuse to allow them outside. I've read that cat's can be trained to walk on a leash. That's not really a solution because once they get a taste of the outdoor life they want to go out to the extent they will sneak out whenever a door or window is available. The ferals are a different story. Their lives are much like the homeless people in my area. They only want to be fed and a warm place to sleep and perhaps a little love. Bringing them inside may not be an option. The animal shelter in my area will not adopt out an animal if it is an outside pet. They are also very strict about other pets in the household. I doubt if I would be allowed to adopt from them because I have a large dog. There are even rules on other cats in the household. So now I'm an indoor only cat only cat lady! The cats don't seem to mind. They keep each other happy playing together. There's an expression that if you never had it you'll never miss it. Furby and Lola were taken in at such a young age I don't know if they even remember the outdoor life. And that's the way I plan to keep it. 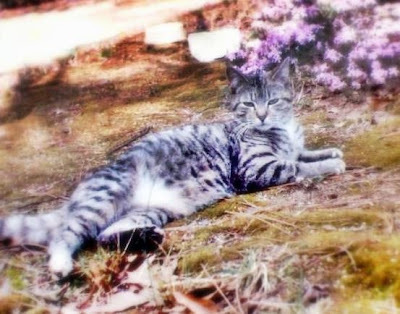 Seven years ago my favourite tabby "Timmie the streetcat" died, leaving her young friend "Smoes the feral kitten" behind. In spite of their stray and feral roots, both were happy appartment cats, used to a limited outside, my 6m2 balcony. My lifestyle changed shortly after Timmie's death. I was away from home too often too long. I had to make a decision in the best interest of the cat. So, my lovely cat Smoes moved to my elderly parents in a nice house with a good sized garden in a quiet rural area. And the best part is: Smoes'lonely days were gone, there is always someone in the house. For Smoes the feral kitten this ment a lifestyle change too. She changed from indoor appartment cat to an indoor/outdoor cat. The funny thing is: she acts in the garden as if it she is on a balcony. She doesn't leave the garden, and doesn't go in the area where she can't look inside the house. Walt sent the ball whizzing round a lot at first but totally ignores it now. Jo doesn't like the ball as he will only play with red balls, but he loves the scratching pad middle. We are still trying to find those new cat loungers in the UK but no luck yet. Furby just got his turbo ball circle today. Hopefully he'll get off it long enough to write a story. Lola likes the scratching material on it. I used to have one of these years ago. Its important for them to have fun. There is still declawing going on in the USA and I'm very much against it. No one tells the cat owner that declawed cats learn to BITE. I agree, no one is wrong and one thing stands out from all the comments on here,we all truly love cats ! It's wonderful to 'meet' other people who are as passionate about them as I am,the sort of people who would die for them if neccessary. I didn't even know until a year gone November when I first found out declawing was still happening in the USA that some people kept cats strictly indoors.I grew up accepting they have their freedom and didn't come across anyone while working for vets or doing voluntary work who didn't think the same way. I can accept and understand now,that in some places it's for the best, after reading the comments of true cat lovers who make sure their cats have the best quality of life indoors to make up for their lack of freedom. What I can't accept is cats sitting bored stiff with nothing to do and their people saying cats like to sleep a lot just because they can't be bothered to give them some attention. And even worse of course, cats deprived of their claws is one thing I will never accept as right. Our boyz are not happy today as it's raining, thankfully it's washing the snow away.They've both been out but now sitting willing me off this computer for some fun and games. Rating Indoor cats vs Outdoor cats. When I grew up, we lived on a large farm and had plenty of cats and dogs. Some of them came in the house and there were others that preferred to stay outside and sleep in the barn. I don't ever remember losing a cat to an accident or killed by a car. They were happy healthy cats and had plenty of woods to explore. One of our dogs got distemper and the vet had to come out (yes vets actually came out back then) and give shots to all the dogs. I believe that where you live determines how to raise your cat. I have never lived in a neighborhood where people killed animals. A couple of cats got killed on the road. Cats in our family always had a cat door, they could go and come as they please. There were occasional presents, my cat brought live animals to my feet and just let them go. I chased them down and let them go free. They always live at least 10 or more years. I live with my sister out in the country and she had a tabby cat that was king. He had his own kitty door and as long as we had him, no other cat or dog came in the yard. He was 15 years old when he got sick and had to go to the vet. This was several years ago when all the cat food was being recalled and he was eating some of it. In his old age it was difficult to find something he would eat, so every kind of cat food was tried and human food. Alas the vet said that he had tumors in his stomach and it was probably caused by the bad cat food. Our recent cat was ferel. I looked out to watch the birds and squirrels and chipmonks feed and lo and behold I saw the most beautiful 3 month old cat. The cat was black, of course when I called, he ran under the barn. We put food and water in the place where he went under the barn. This continued for months, he would come out only when we left. Slowly we moved the food dish farther away from the barn. From the very beginning he would talk and talk to us and we would try to get him to come closer. Then, one day as I fed him, he came out and slowly I reached down and touched him. After that it was several more months and we could pet him, he had been won over. We tried to get him to come in the house, he would look and lay down on the porch. Finally we got him to come inside and lay on the rug at the door. He would let us pet and scratch him and my sister even got him to lay on a rug on the couch. Then one day he didn't show up, 3 days later he came to the door and that is where my sister found him. He may have been hit by a car or by someone, or the dogs chased him up a tree and he fell trying to come down. We took him to the vet, he said his liver was failing and would have to be put to sleep. We haven't decided to get another cat, but if one comes up I am sure we will take it in and feed and love it. Cats are a comfort and petting and playing with them relieves stress. They say people with cats or dogs or other pets live longer. I wish all my cats could go outside if they wanted. My first cat Cat was a stray my mom gave me after years of pestering. He stayed inside for half of his life because he was declawed. Cat was still tough and when the day came that a friend let him out there was no turning back. He was the neighborhood tom even though he was fixed. I remember him protecting Sophie a kitten my dad found on the side of the road and I saw him and our dog jump over the fence to save young Timmy from a black tom. Cat was hurt twice most likely from fighting and ended up with a crumpled ear. He usually came in at night when we called but not always. Cat got old but still spent his twilight in the sun. At 20 Cat went missing. All we found was his back leg. The rest of him probably eaten. Sounds horrific but I believe Cat was accepting of his fate. People are the same when it comes to living life fully. To die doing what you love..? I will forever remember Cat as he never forgot me (long story). I won't morn a life fully live. Sophie was later found dead and Timmy went missing. It is heartbreaking to find your friends gone but it is bearable when you know deep down in a place not understood that a loved one was okay with passing on. All the cats since have been indoor because I live in the city. One must weigh the safety and the quality of life. Someday I hope to have a safer place for cats so they can go outside and do cat things. Yes is is dangerous but no one wants to be locked up. Never have I been more at peace for the lose of a friend. This is indeed a subject likely to stirr up emotions, but I have to say that I mainly agree with Joyce. I've earlier stated that point of view in my comment to 'Indoor Cats are Loved Cats?'. I don't live in the USA, but I've seen enough roadkills here in peaceful Denmark to keep the cats inside. Well, the fact that we live on the third floor sort of limits the possibilities, but even if we had a garden I would not let out the cats - except for in a safe enclosure. I wouldn't dare! I would like to add that 13 of these cats were ferals that just showed up. I made the decision at the time that I would feed them instead of trying to trap them in a cage, take them to the shelter where they could live out the 3 days allotted(per shelter rules) in a small cage then be euthanised. The average outdoor cat life span I listed can be referenced by entering 'average life span of outdoor cat' into your search engine. One source quoted 1 1/2 years but most agreed on 4-5 years. I do not know how they reached this conclusion. It wasn't one I just made up in my head. You're right Barbara. It IS a pleasure and an honor to own a cat. The underfoot statement I made referred to my mopping the floors and cleaning the house. I liked to put the cats outside while I did this so I wouldn't be stepping on tails. I meant no disrespect to the cats.I would also like to add that I have owned 9 cats in my life and that includes Lola and Furby. The rest were ferals I have or have not tamed and had no control over where they lived. I've adopted out countless kittens that were the offspring of the ferals. The shelters in my area are literally a death sentence. It is out of love and fear that Furby and Lola live inside. They are happy inside and have plenty of attention paid to them by myself and my daughter. They play most of the day and half the night with each other. I would love to turn them out for awhile every day because you're right when you say cats deserve hunting, playing, napping in the great outdoors. I live at the end of a dead end road. The sad truth is 2 small dogs who lived a few houses up were both ran over at the same time by someone who lived on the road. There are children in the neighborhood so speed wasn't a factor. There are woods behind my house Lola and Furby would love. There are also wolves, coyotes, foxes, racoons, bobcats and packs of wild dogs. There have also been pets kidnapped by Satanic cults. Back in the late 1980's I worked with a lady who told me the location of the cults in my area. I don't know if the area any of you live in has this problem. I do know that one of the cults is less than 3 miles from my house. You may ask why I moved so close to a cult but I had forgotten all about it in the 8 years I lived out of this area. I only remembered it when my next door neighbor told me not to leave my animals out because they could be stolen. This same neighbor had a dog killed by poisoning a few years back. Call me selfish but I want Lola and Furby to live to a ripe old age. I live next to really great neighbors. A few years ago we had 3 dogs turn up missing. That morning I heard 3 gunshots and we never saw the dogs again. It is also against the law in my area for an animal to be outside without a leash. The owner can be fined and the animal taken by breaking this law.I think we have to look at the indoor outdoor issue on a case by case basis and not judge each other. The problem is that too many people lay down the law of what others should do, they give no thought to the fact that we all have different circumstances and we base our choices on those. It's wrong to look at this subject in an either or way and for each side to think they are right ! Most of us want the same thing,which is a happy fulfilled life for our cats,the best life we can give them in our own circumstances. The sweeping statement of 'the bygone era of the outdoor housecat' does not apply in the UK. All the vets I know/have known agree that a cat allowed some freedom is a healthier happier cat,so as long as we live in a cat friendly place, our cats will have that freedom. As an Air Force Brat raised in Europe I wandered the green forests picking blueberries, or took little jars to the nearest pond to catch guppys, life was simple then. In the 1980's I traveled back to the UK and as we were prepairing to land at Heathrow I looked in amazement at the beautiful green fields and the quaint houses with Mary Poppins chimneys. It seemed as if time had stood still since I had been there before. As I prepare to land in Los Angeles, or Denver, or Portland etc, I see roofs of thousands of tract homes, with an ocasional park thrown in for good measure. As an American, this is my world, like it or not and it is a dangerous world for cats, Like Joyce I had outdoor cats untill the 1980's when I decided I had lost way to many young cats. Cats who had died from traffic, or terrible neighbors who hated cats. Just this week I lost cats to an angry landlady with a gun. Now I am looking for another home, and finding a home to rent where the landlord allows cats presents a new problem. My cat is never outdoors, she has been inside since she was born. She has more than enough cat trees, toys,and boxes to entertain herself and is a very happy cat.She is not declawed, and please don't assume all indoor cats in the USA are declawed, they are not. I find declawing of cats as totally unacceptable, therefore I have lots of scratching posts, and an occasional talk with Faith when she prefers my furniture. Rating The outdoor housecat is alive and kicking! Well the cats in my area are still happily enjoying the best of both outdoor and indoor life, as do my own cats. The fact is that I enjoy being in my warm cosy home sometimes, but other times, especially when the sun shines and the birds sing and the grass is green and lush I want to be outdoors, and if I get to be allowed to enjoy nature then why shouldn’t my cats? Your comment “The owner didn't have the cat underfoot all day” as a reason for letting cats out in your “bygone era” left me a bit puzzled I must admit, why on earth would someone consider a cat to be underfoot all day? Cats are optional; no-one is obliged to have a cat if they find them a nuisance. I don’t believe an indoor cat is fulfilled, I think they miss out on an awful lot of life’s pleasures but that is my opinion and everyone is entitled to their own and of course it depends a lot on where you live, you have to use your judgement and think hard, are you indulging yourself by having cats in an unsafe place or can you really offer them a fulfilled life. If cat after cat is being lost then you have to ask yourself if you really should be keeping cats don’t you? I have never lost a cat at a young age from being outdoors, I think the myth that cats only live 3-4 years has to be taken with a pinch of salt, yes some do meet accidents, as a lot of your seem to have done, but many, many more live long and happy lives too. “once they get a taste of the outdoor life they want to go out to the extent they will sneak out whenever a door or window is available.” And I suppose that your own cats have had to accept that you “refuse to let them out” and adapt to their captivity but I disagree that what you’ve never had you never miss, cats are by instinct hunters and roamers, not pretty ornaments to sit on the windowsill looking out dreaming of chasing birds and mice and rolling in the grass. My cats are as free as I am, and that’s the way I plan to keep it. I don't know of anyone (and I do have many many friends and contacts who have cats)in the UK who denies their cats their freedom.That is of course apart from the 15 rescue cats next door, but they have their own spacious cat run now.There is no excuse for not providing some sort of fresh air and the joys of nature for cats. Most cats love going out, we've had cats for 35 years now and all but 2 have lived long happy fullfilled lives to around 17 years of age.The 2 we lost were from incurable illneses nothing to do with going outoors.So where do these average lifespans of outdoor cats come from ? Are the long lived indoor/outdoor cats counted ? As well as in the North of England, I have friends in Devon,Hertfordshire,Essex, Bedfordshire and Cardiff who have old cats still enjoying going out.Proving that there are cat friendly places to live in different parts of the UK.But of course, like us,they don't let them go and forget about them.As responsible cat owners,like we are, they keep an eye out for the cats welfare and safety and they keep them in after dark and when no one is home. We always make sure we live in a cat friendly place.At our old home when cat hating neighbours moved in, we moved here after much research on the area and neighbourhood. We'd do it again too if neccessary. Cats have had almost everything taken from them due to progress,yes some of it good, such as neutering.I'm old enough to remember the days when people drowned litter after litter of unwanted kittens.But progress is also destroying the last shreds of natural life for cats,from being wild free animals they are now domesticated pets having to live by our rules.Maybe some people would be happy if cats were born with no claws,no free spirit and no inclination to do anything but sit looking pretty on the windowsill? The rot set in in the USA when it became fashionable to keep cats indoors 'Indoor cats don't need claws' is the excuse of many people who have their cats mutilated by declawing.They DO need claws, they are cats, cats come with claws because they need them !How many times do we hear 'my cat is evil,if he doesn't setle down I'll have to kick him out' Why ? Just for wanting something to do !!! Who can blame a cat for wanting to live life ? I hope I don't live to see the day cats spirits are broken as well as their bodies adapted just so that people can possess them the way they want them to be rather than the way they have a right to be ! Prisoners, leashed(I'm not knocking those whose cats don't mind this way of exercise) or taken out in strollers, if I had to do any of those things to such beautiful creatures I'd never have another cat because I LOVE cats ! Thanks for this Joyce. I find it very interesting. It does evoke those relatively innocent days. Were they better days? I am not sure. I feel that they were. But was it better for the cat? Not sure either. They seemed to have fuller, more natural but considerably shorter lives, on average. Is that bad? Not sure. Lots of questions and no easy answers. I feel that the best answer is the middle road of supervised outdoor trips or nice and interesting cat enclosures. But this is a personal choice. 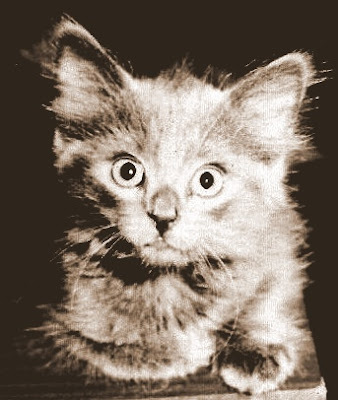 The list of cats and how they died is almost a mini-survey of how cats died in the era. Fascinating. We give our cats their freedom—we have a large double-wired run outside in the backyard for them that they can access 24/7 by means of a doggie door. They can go in or out anytime they wish. During the summer, they spend 95% of their time out in the run. Our small dogs also use the run. Their litterboxes are also kept out there in a shelter that I can access from outside the run to scoop. There are real logs for them to strop their claws on too. The run is 7 feet tall, 10 feet wide, and 20 feet long, and is built right against the house. Anyone who wishes to allow their cats outside should really consider building or buying a run to keep their babies safe.